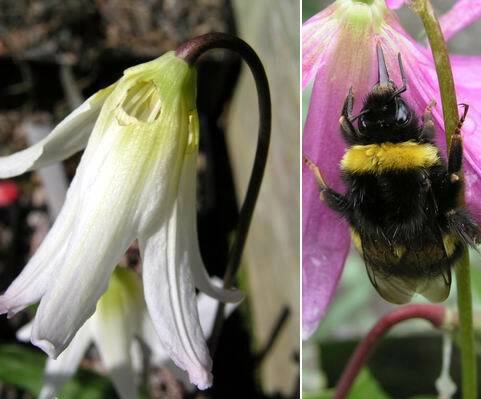 I showed you the bee in the last log and this explains all the holes in the top of the Erythronium petals where the wee devils are smashing and grabbing the nectar treats. 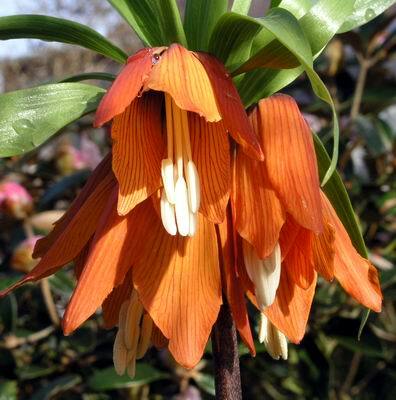 Both E. revolutum and oregonum grow well in a woodsy type soil and they grow equally well in both full shade and full exposure to the sunlight, here in North East Scotland. E. oregonum is the slower of the two to build up in numbers as it seems to set less seed than revolutum. 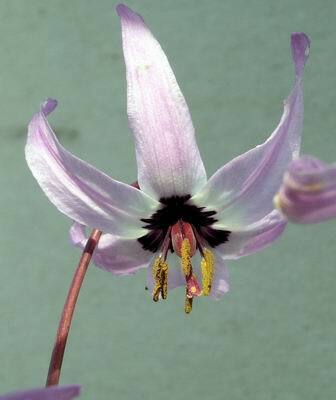 Maggi was delighted to find this dark centered form while we were enjoying one of the erythronium frames. The question is whether it is just an unusual form or has it crossed with E. hendersonii ? 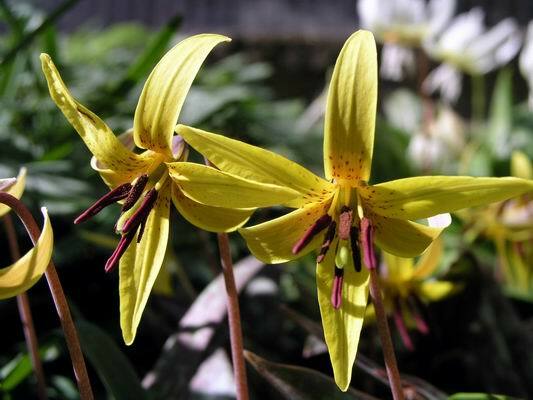 This is Erythronium tuolumnense, the parent of most of the yellow hybrids, like Pagoda. 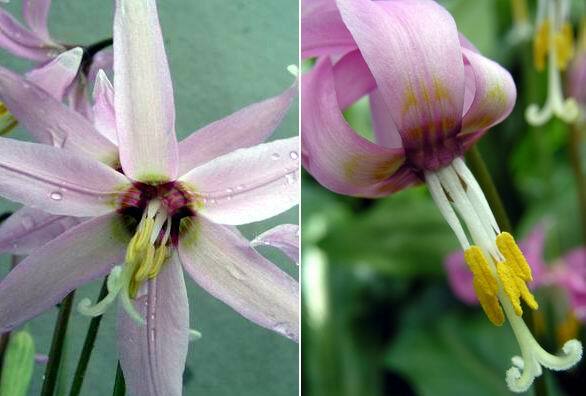 It is a good parent because it increases rapidly by offsets often producing two or three flowering sized bulbs in one year. We have several forms of this species that are very nice and compact plants - the commonly available one, I think, has rather large leaves. 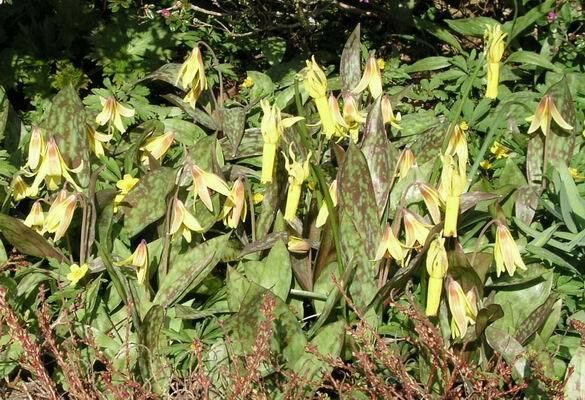 Still yellow but at the other end of the size scale is Erythronium americanum ; much maligned for producing masses of single leaves and very few if any flowers. This is what we call our free flowering form, it has attractively marked leaves and flowers reliably every year. This one, that I call the proliferating form, spreads rapidly by stolons and has been a poor flowerer for us - well, it had until last year, when it produced around 35 flowers. 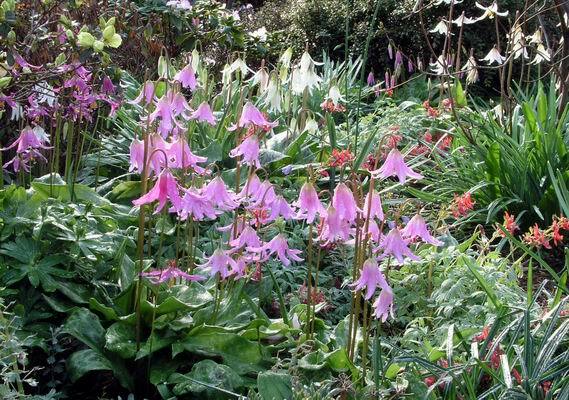 This year it is again flowering well with around 50 flowers so - what has caused this change? At first I thought it had to be climatic and as we have had warmer summers for the last few years, could it be the heat? Then I remembered that it has a poor reputation for flowering even in the warmer south, so there has to be more to it than that. 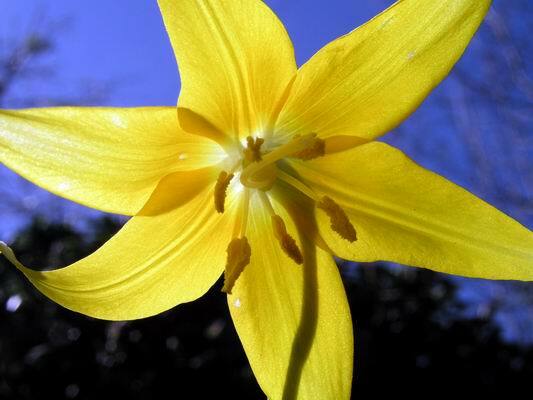 This is Narcissus cazorlanus which I said I would show you when it flowered. It is N. triandrus crossed with N. bulbicodium. 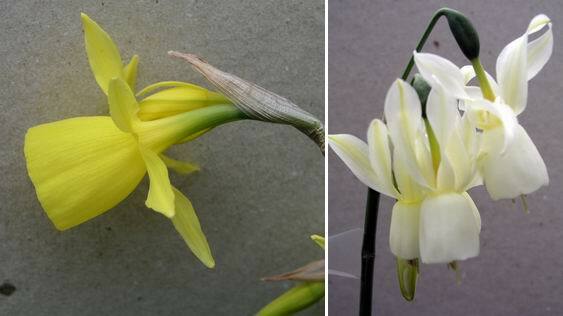 It is an attractive narcissus, it usually produces two flowers per stem, the second appears a week after the first. It increases well by division of the bulb so your numbers will soon build up. The N triandrus in the picture has five flowers on the stem and some clumsy clot snapped the stem a week ago when it was still in bud, while he was taking photographs. Although it was broken and hanging down it was still attached on one side by the skin so I sellotaped it together and the flowers have continued to open and show no signs of suffering. In the garden the largest of the frits, F. imperialis, is flowering. 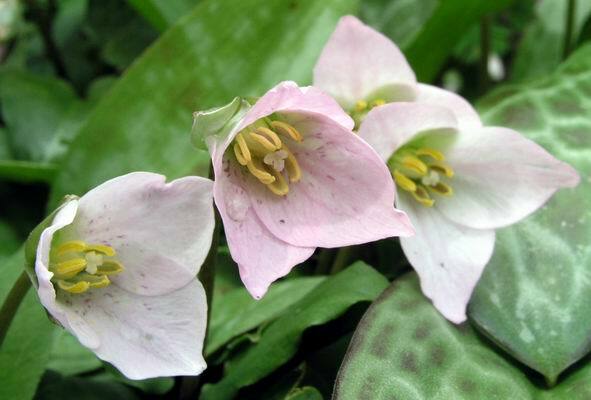 It is such a stately plant that is so often mis-used (in my view) in mass plantings. I think it needs to be kept as individual stems or small clumps so that the beauty of its flowers can be fully appreciated. 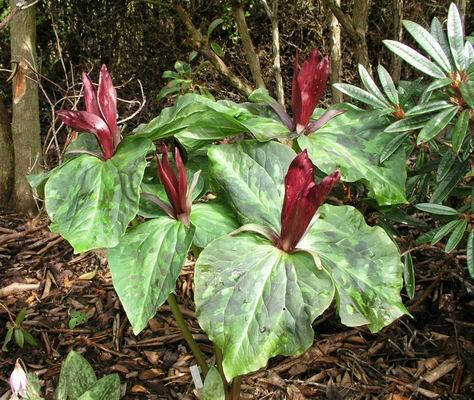 Trillium chloropetalum is at home growing under the larger rhododendrons and is always amongst the first of the large trilliums to flower. It has a nice scent of mangoes. Trillium erectum is similar in colour but has a very different shape of petal and I think that T. ovatum is my favourite white flowered trillium. 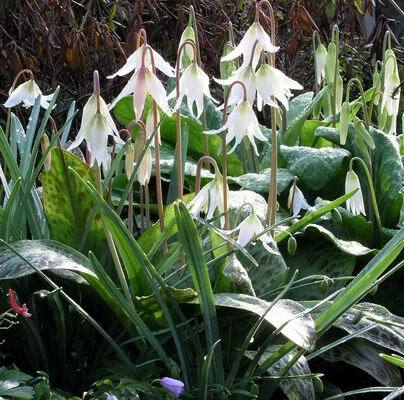 At the other end of the scale is Trillium rivale, here it is just peeping out over some Erythronium leaves.